Administrative/Biographical HistoryRegina (née Bulwik) Feldman was born on December 6, 1931, in Będzin, Poland, a city with a thriving Jewish community. Her parents were Balcia Bulwik (née Klizman) and Chajm Bulwik. The family lived in the Będzin ghetto until they were separated by German soldiers near the end of 1941. Regina was transferred to Klettendorf, then Ludwigsdorf. After the war, she moved to Feldafing, where the barracks, once used by the Germans as a Hitler Youth School, had been turned into a kibbutz. There, Regina’s only surviving family member, a cousin and his wife, found her and brought her to the Fulda displaced person camp. She stayed with her cousin until 1947 or 1948, when representatives from the United Nations Relief & Rehabilitation Administration arranged for her to be sent to Canada to be adopted under the Canadian Jewish War Orphans Project. Regina travelled to Canada via the Aglasterhausen transit camp to Bremerhaven, where she boarded the ship SS Sturgis, bound for Halifax, which landed in February 1948. The ship was met by the social worker Mrs. Jean Rose and members of the Canadian Jewish Congress. Regina Feldman boarded a train and arrived in Vancouver four days later. Regina told her story to audiences including church groups, high school students and participated in video productions such as those produced by Steven Spielberg’s Survivors of the Shoah Visual History Foundation. She and her friend Lola Apfelbaum raised over $45,000 for charitable organizations, including the Canadian Hadassah-WIZO (CHW), by selling aprons. Regina Feldman died in Vancouver in 2002. 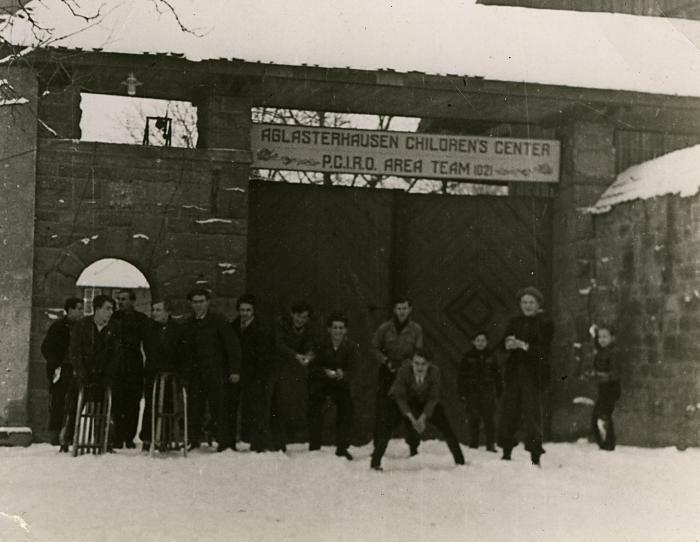 Scope & ContentItem is a photograph of a group of children outside Aglasterhausen transit camp in Germany, where Regina stayed while waiting to immigrate to Canada.